What It’s About: While the Battle of the Bulge rages and the German Army approaches, a group of American walking wounded recuperating in a 10th century castle must decide if they should join the retreat, or make a final stand. At the same time art historian Captain Lionel Beckman (Patrick O’Neal) attempts to persuade their commanding officer, professional solider Major Abraham Falconer (Burt Lancaster) to force the fight elsewhere to protect the castle and it’s art collection. Why Watch it Today? : The Battle of the Bulge began today in 1944. While Castle Keep is not a conventional or historical war film but instead a surreal meditation on the nature of conflict and the value of art and history, it is an excellent film. 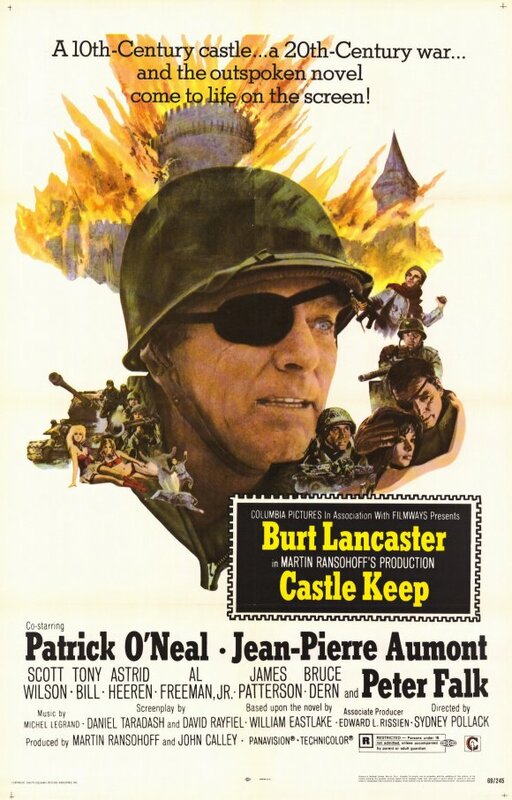 Castle Keep features strong performances from its cast, particularly Lancaster, O’Neal, and Peter Falk (stealing the show as Rossi, a baker-turned-Sergeant), beautiful images from cinematographer Henri Decae, and surreal situations much improved from William Eastlake’s tepid novel. This entry was posted in Adaptation, Based on a Book, Black Comedy, Independent, Last Stand, Movie of the Day, Period Film, Satire, War Movies and tagged academic, Al Freeman Jr., Avala Film, baker, Battle of the Bulge, before they were famous, Bruce Dern, Burt Lancaster, castle, Columbia Pictures, Filmways Pictures, France, Henri Decae, historian, James Patterson, Jean-Pierre Aumont, Nazis, Patrick O'Neal, Peter Falk, Scott Wilson, surreal, Sydney Pollack, Tony Bill, William Eastlake, World War Two.